This morning Cadillac introduced a new campaign from its new agency (Adweek 12/1013). The good news is that for the first time in a decade and a half, the product is as good or maybe better than the advertising. The new ATS and CTS are getting rave reviews from the industry pundits and there seems to be broad agreement that finally, the Cadillac product is up to the job of moving the brand into the rarified air of Tier 1 luxury where Mercedes-Benz, BMW, Lexus and Audi compete. The Cadillac brand has been through a lot of marketing fits, starts and shifts over the last decade and a half. Messaging has been inconsistent and no real brand values established. That said, there have been some terrific ad campaigns that have gotten the brand noticed, unfortunately the product wasn’t as good as the advertising. The Breakthrough campaign really helped Cadillac get noticed again after years of being ignored by boomers who were buying Mercedes-Benzs, BMWs, Lexi and Audis. http://autoperspectives.com/blog/wp-content/uploads/2011/01/cadillac.gif 200w" sizes="(max-width: 150px) 100vw, 150px" />Cadillac and Time Warner have just started a new program called “Business Unusual. Daring stories from the road to success.” Comedian Chris Hardwick is the host and the basic concept is that he will interview entrepreneurs who have defied the odds by taking a risk and turning it into a successful business. The outputs are videos featuring Hardwick and the entrepreneur(s) discussing their venture, what worked, what didn’t. The objective is to draw parallels between what these entrepreneurs have done/do and Cadillac. Fair enough, but let’s face it, the promise to the consumer is an interesting story about an entrepreneur and secondarily a bit of information about Cadillac. The two available videos (at cnnmoney.com) illustrate the difficulty of finding the balance between providing the content that the consumer is promised versus the commercial message. The first video is about a company called Wagic and I think does a pretty good job. The entrepreneurs, their business and products are interesting. I felt as if I actually learned something about their business idea and how they succeeded. There is only one moment where I felt the commercial interests intrude. Toward the end, Hardwick asks shamelessly “how do you go from something like this (pointing to a Kiddalac riding toy) to something like this (pointing to a Cadillac CTS).” That then leads one of the entrepreneurs to say, “they (Cadillac) started from scratch, that’s what we would do if we were going to make a revolutionary car.” I don’t mind the opening and closing visuals of the car that Hardwick is driving, but forcing the brand strategy into the conversation was a bit over the top and left me a little frustrated. Cadillac breaks new ground in auto industry marketing with an old idea. I was speaking with a colleague the other day and we were trying to think of an instance where an automobile manufacturer (or any brand for that matter) looked back into its own history and re-introduced a brand tagline that had been thrown in the bin. We couldn’t think of any and we began to talk about what a mistake that was. We were able to rattle off a number of instances, where great automotive brands walked away from positioning or taglines that perfectly encapsulated their brands. Mercedes-Benz left behind “Engineered like no other car in the world.” Volkswagen threw away “Drivers wanted.” Chevrolet moved away from “Heartbeat of America.” A few months ago, BMW, one of the most consistent marketers in the industry, looked as if they were moving away from “The Ultimate Driving Machine” in favor of “Joy.” In the case of BMW, this has been hotly denied and “TUDM” still appears at the end of the ads but it has certainly been demoted. Why does this happen? Why does it seem so difficult for marketers to realize that they have a real asset that needs to be protected and nourished? A lot has to do with the constant pressure to increase volume and the find something new to “take the brand to the next level.” The other factor is the constant churn of marketing management and agencies. New marketing leadership needs to demonstrate that it is moving the business forward and that means doing something new. Every agency is genetically coded to do something “new and unexpected” to burnish their reputation. Bringing back an old idea can also be seen as a copout. JD Power’s 2010 Vehicle Dependability Study–It’s tough to buy a bad car. JD Power just released its 2010 Vehicle Dependability Study and there are some surprises. Porsche is ranked 1st, Lincoln 2nd and Buick and Lexus are tied for 3rd. It wasn’t so many years ago that Lexus dominated the VDS study as the perennial number 1 and some may wonder what has happened? Particularly in light of the well publicized Toyota quality issues. The fact is that nothing has happened to Lexus, they design, engineer and build an extraordinary vehicle. What’s happened is that the other manufacturers have improved to the point where every year it’s a genuine dogfight to get to the top spot. Can Cadillac succeed in Europe? Amid all the drama surrounding GM, every so often I see something that strikes me a smart. In Geneva, Cadillac announced it’s aspirations for Europe (WSJ 3/8/10 Sub required, NYT 3/2/10). After a number of high profile failures to enter the European market in a big way, the folks at Cadillac want to be a niche player and are willing to accept the lower volumes that go along with such a strategy. By keeping volumes low, and presumably margins high, they expect that they can be profitable from year 1. Last year when I was considering what new luxury segment vehicle to purchase I had an experience that I think bodes well for Cadillac. Keep in mind that my family has a long history with European imports. 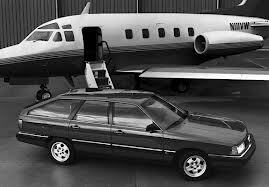 In fact the last domestic product we bought was a 1986 Jeep Cherokee, just before the SUV craze really took hold. Since that time we have had Volvos, a SAAB, a Mercedes Benz, half a dozen Audis and a couple of VWs. For the last fifteen years my family has been happily ensconced in a series of Audis. As great as our experience has been with our Audis (we still have 2 in our household fleet) I thought it might be time for something new. Now it was my turn to be surprised. I admit that I have impressed by the design direction of Cadillac and I certainly recognize that the product is greatly improved but “cool” from a twenty five year old’s point of view? For 30+ years we have watched the Europeans and Japanese recreate the luxury segment as the domestics lost favor. Very few baby boomers thought of Cadillac or Lincoln as marques they wanted in their garage. Mercedes-Benz, BMW and Lexus have been their first tier luxury brands of choice. However, the preeminence of these brands is being challenged.